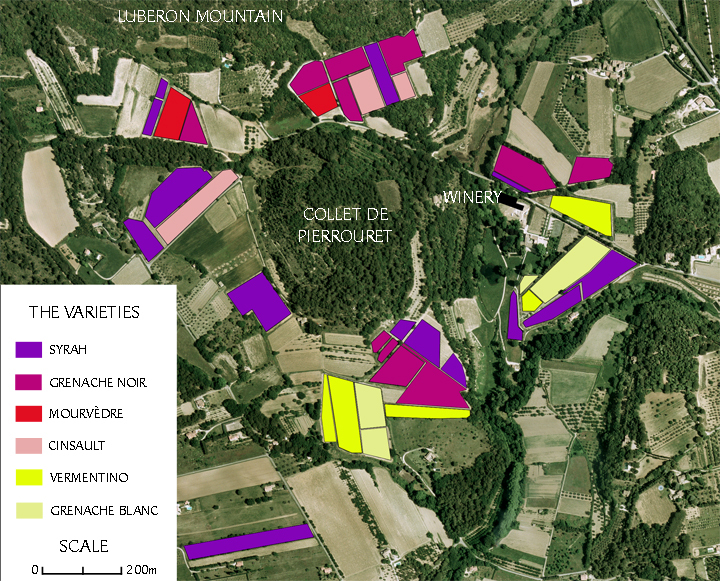 The implantation of these varieties has been carefully considered in order to get an optimal harmony between the characteristics of the parcel (soil, topology), the variety, and the standard of wine expected. Globally, the varieties used for quality red wines (richness, concentration) are preferentially planted on hillsides with pebbly soils of molasses, whereas the flat and sandy parcels are ideal for the white varieties (freshness and aromatic fineness). Numerous over-grafting (replacement of a variety by a new one without uprooting the vines) have been done between 2003 and 2006 in order to reach the optimal implantation of the vineyard. Last, but not least, the great age of vines secures a natural regulation of the yield, wich is below 35 hectoliters/hectare, and guarantees a high concentration of polyphenols and aromatic precursors in the berries (be they red or white). Our oldest parcel was planted in 1958, wich is quite an outstanding fact.